If you've followed the Law of Attraction for any length of time, you've heard that how your desire manifests is up to the Universe. The how is not your problem. Being open to receiving is. 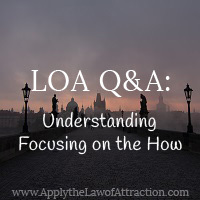 Focusing on the how is one of the major reasons that a lot of people struggle with the Law of Attraction, many failing to ever manifest their big goals. But what exactly is the how? Could you actually be mistaking your desires for the how? 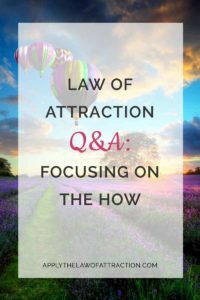 This is such a great Law of Attraction question because it's a stumbling block for many people preventing them from manifesting their heart's desire! If you want to attract money, you don't want to focus on winning the lottery. Winning the lottery is the how. When what you truly desire is money and feeling wealthy, focusing on winning the lottery limits the way that you can receive money. In fact, you can shut yourself off from receiving any money at all because you are so focused on money only being able to come to you by winning the lottery. Every time you think that you want more money and thus you're going to use the Law of Attraction to win the lottery, you're telling the Universe how your desire MUST manifest. But in telling the Universe that you MUST manifest money by winning the lottery, you are actually revealing that you have resistance towards receiving money. If you were truly open to receiving money, you wouldn't care how it came to you. You would be totally enjoying the feeling of being wealthy now, trusting that an infinite amount of money is coming to you in the best way(s) possible. You would be manifesting money left and right! Now, if you actually want to experience winning the lotto – that's your true goal – not the money, not the overnight wealth – but the actual experience of winning the lottery, then focus on winning the lottery. But if you actually want to have more money, you should focus on feeling wealthy now. Forget about how the money will come to you. When you do so, you will open yourself up to unlimited possibilities for money to come to you. You might still win the lottery, but you might also receive an inheritance, a raise at work, a tax refund, or a multi-million dollar money making idea (Chia pets or Elf on the Shelf ring a bell?). Winning the lotto is a great example for this question because it's such a common mistake people make when using the Law of Attraction. But please don't limit it to just the lottery. People regularly ask me questions where they're focusing on the how instead of the end result. For example, people who deep down want to manifest a loving, committed relationship get mired in the day-to-day details, not their end goal of a relationship. They might focus on creating the exact text they want someone to send them after a date or how many times a day someone contacts them. As wonderful as these things are, they're a part of the how. When you try to create the exact text someone will send you, you don't open yourself to the possibility of receiving something even better than you can imagine (e.g., a phone call, flowers, a handwritten love letter). You might receive the text, but you probably won't receive the relationship. I totally get where you're coming from when you're focusing on the how. But when you get bogged down into how something is going to happen, you display signs of both resistance and controlling the outcome. This blocks the Law of Attraction from working for you. You don't need to focus on the how or the little day-to-day details. When you truly have your desire, you will have the fulfillment, happiness, abundance, love, and respect you're seeking. Whether it's winning the lottery, receiving a text, or something else entirely, make sure that what you're asking for truly is the end result you desire. When you focus on the end result, you let go of the how. You get out of your own way and allow your true desires to manifest. I get it you focus on the end result – such as being happily married and great relationship, kids, etc. Instead of focusing on how it happens. I was wondering is it still ok to visualize romantic date nights from the viewpoint of already married and the relationship is AMAZING???? What is your end result? Romantic date nights or an amazing marriage? I guess this is one of the things that confuses me. I visualize a lot of things that we would do once married; hanging out, having children, holidays and even the occasional husband/wife date night. If these are done “in the scope” of being in the relationship we desire, as part and parcel of being with that person in a relationship isn’t it OK? Isn’t it saying “I want the awesome kind of relationship where these things happen”? If not what kinds of things should we be visualizing. Great article, but I do have a question…. I’m working on attracting a specific person. We haven’t actually met IRL yet, so I’m trying not to focus or think about how that will happen, though it is difficult not to think about it at times. For the most part I focus on what I want the relationship to look like what it’s “happened.” The part I’m not sure of is that I often like to visualize the beginning of the relationship. Nothing specific; no long drawn out scenarios. Just the feeling you get when a relationship is new – the excitement and fun. Most of the time these start after we’ve met and focus on how quickly we hit it off and how instant the mutual attraction is. Is this getting to close to the “how” or am I OK? It sounds like the how. It reminds me of Elizabeth’s text example. You’re “bogged down in how something is going to happen”. You’re looking at how the relationship will come to you. You aren’t visualizing as if you are in the relationship. Good point. In thinking about this I’ve caught myself doing something in my visualization that is probably a no-no. My “target” lives in a different county. One of my visualizations involves moving to that country to be with them once we are in a relationship. Reflecting on that, I’m telling the Universe that the relationship has to manifest _before_ I relocate. And that I had to relocate at all. Talk about something that’s potentially limiting! I’ve since “tweaked” them to be “We’re in the same place, how we got there (and where that place is) doesn’t matter. Thanks and merry Christmas, Elizabeth! I think you’re a bit too much worried and it might be blocking things for you. Try to surrender completely to the feeling of your wish fulfilled, be absorbed by this feeling; let go of your worries and be in a wonderful state where your wish is already fulfilled. I guess this is really important. Thank you for this post! Now I understand what was stopping my dreams to become reality. Thank you really that I have now shifted my focus on the end result of my dream and I am so grateful to have found your website. Thank you!